Dematiaceous, or darkly pigmented fungi are a large, heterogeneous group of organisms that have been associated with a wide variety of clinical syndromes. These are uncommon causes of human disease, but can be responsible for life-threatening infections in both immunocompromised and immunocompetent individuals. In recent years, these fungi have been increasingly recognized as important pathogens and the spectrum of diseases they are associated with has also broadened. The clinical syndromes caused by the dark-walled fungi are typically distinguished based on characteristic histologic findings into chromoblastomycosis, mycetoma, and phaeohyphomycosis. Chromoblastomycosis and mycetoma are caused by a small group of fungi that are associated with characteristic structures in tissues and are usually seen in tropical areas. These are discussed in Chap. 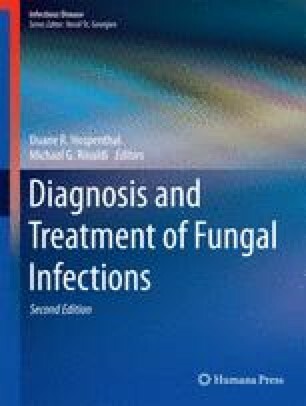 22 (Fungal Infections of Implantation). Phaeohyphomycosis is a term introduced by Ajello et al. in 1974, which literally means “infection caused by dark-walled fungi”. It is a catch-all term generally reserved for the remainder of clinical syndromes caused by dematiaceous fungi that range from superficial infections and allergic disease to brain abscess and widely disseminated disease. These fungi are alternately called phaeoid, dematiaceous, dark, or black molds. While typically, phaeohyphomycosis is a term limited to infections caused by the dark molds, there are dark yeasts that rarely cause infection, and these are also included under this grouping by many experts.